One of the stated strategic objectives of the latest Community Plan promises residents that Council will – Provide you with regular and transparent reports on key outcomes and on our performance. If this is truly the objective, then why is the latest State Government Community Satisfaction Survey results buried deep on council’s website and no officer reports extolling the virtues of this council have made it onto the agenda for the past two years – in stark contrast to what was previous practice? 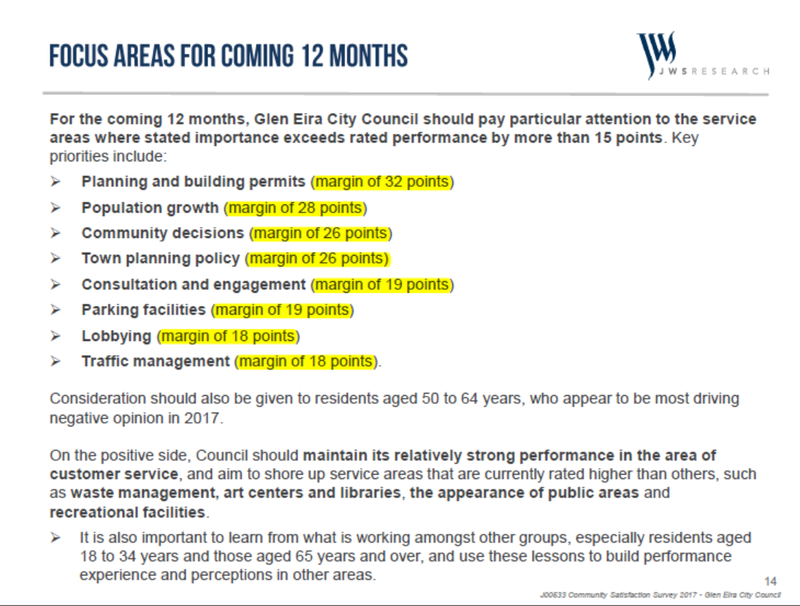 The answer of course is that Glen Eira is on a continuous downward spiral when it comes to residents’ perceptions of performance. The dissatisfaction with those old perennials of planning, traffic, consultation have never reached such a low ebb. 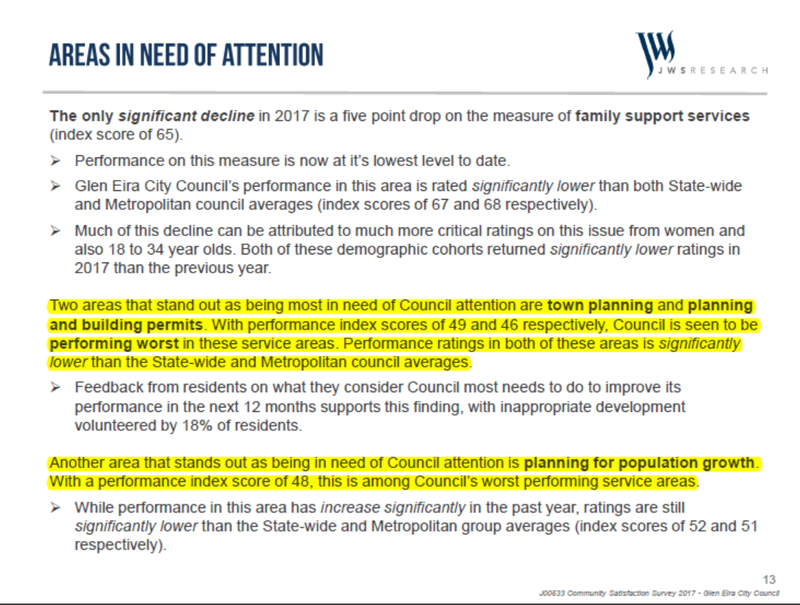 Many of the results listed are below both the Metropolitan average as well as the State average for all councils. The most important indicator in our view is the differential score between ‘importance’ and ‘performance’. In other words, how important residents regard a particular aspect of council’s work compared to the actual performance of that work. Glen Eira has never had a differential of over 30 points as this year’s survey reveals. Year after year these areas have been highlighted by responses as basically failing resident expectations. That this is still the case, and worsening, says much about how council is addressing residents’ concerns. Cr Jamie Hyams posted on Facebook today that “you need to drill down a little deeper when you look at anything from GE Debates”. Here’s a great opportunity for the Cr to drill down a bit further on these survey results and provide a genuine action plan for improvement. Perennials is right. Downhill is dead right. Year after year the tally is the same on issues like planning only hitting rock bottom this year. Why this council is so much worse than its neighbours and even all councils in the state demands an investigation. I’m not surprised, the new town hall brush cleaned out some of the worse performing bureaucrats. Many Newtonites still remain locked into their singular mindsets of residents are the enemy and therefore they must be swindled of the truth. Anyone attending the EE Gunn Masterplan public meeting fairly recently would have been appalled at the sidelining of resident input in this masterplan process. It was signed sealed and delivered even before we took to our chairs. Is council going to wake up and realeze that rising population and unsustainable development is an issue? Apart from the Booran Reserve no new open space has been made available, the tiny little pocket park in Elsternwick looks good and adds to the neighbourhood character but provided no new open space. You cannot hoodwink people into thinking that closing a few streets and making the intersection a mix of concrete and grass is providing worthwhile open space for a burgeoning population. It even fails council’s own criteria of being usable public open space. It’s street landscaping or beautifying at the most. Meanwhile the open space levy grows, and if my thinking is correct the bureaucrats will be thinking of ways to spend this money on new pavilions and bigger carparks in our open space, result being a net loss of passive open space. I think the percentage of Glen Eira residents that participate in active club sport is around 16%, and they consume an immense amount of our budget providing facilities, new or upgraded pavilions costing in the case of Duncan MacKinnon pavilion 11 plus million dollars, new grassed ovals at 350.000 to 500.000 a pop, renovated and extended carparks at 100.000’s a pop. All this spending on this 16% of residents take a lion’s share of our budget. The vast majority residents that do not play club sports, get almost nothing or at the best what’s left over after the sporting clubs have had their wants satisfied and gold plated. I’m not surprised at the disatifaction growing in the higher age groups, we the passive open space users are continually being disenfranchised from our meager open spaces areas, time and time again. With most councillors bending over backward to make sure this happens. Councillors like Magee and Hyams and others past and present have the mindset that passive open space is just disused land waiting for them to hand over to their sporting club mates to become larger or new sporting ovals,carparks, cricket nets, places for larger pavilion etc. I could bang-on what vitally important services passive open space if managed correctly would bring to residents. But a lot of residents are beginning to work this out for themselves, and hence the dissatisfaction is growing. Yep – and this is all before many, many already approved developments have been built. It started with the opening comment that nothing much is going to change at the reserve, followed shortly afterwards, we were told the schematic plans/map made available on the tables as part of the consultation process, were outdated and the latest version was not available to see. Unbelievable. Mackey Mouse consultation. Waste of time even worse withholding facts and real information. Ge debates has facts and figures at hand unlike councillors who either don’t know, don’t want to know or don’t know how to find out. Each time I’ve attempted to drill deeper on statements councillors and Council have made I’ve hit a transparency roadblock. You can ask public questions but they won’t provide the requested data. You can write detailed submissions to refute officer claims of standards compliance—ignored. You can seek information about Council’s standards, only to get fobbed off with something along the lines of the standards are only one of many decision criteria. Council has strongly discouraged people asking public questions. One councillor in particular likes to attack residents rather than address their concerns. Those of us who have been impacted by all the development activity are far from reassured by the admission that Council hasn’t done structure planning for 15 years. Yes, I think it is time the GE Council started listening to Carnegie residents about chronic overdevelopment. On this point, what’s happened to Jewish Care’s plans to put up an aged care hospital in a NRZ on the site of the tragically (and corruptly) demolished Frogmore historic site in Wahgoo st? Clearly such a development is completely inappropriate for this quiet neighborhood. If GE was so keen to represent the whole community, council should seize this once in a lifetime opportunity to share this size parcel of land and turn it over to much desperately needed passive open space desperately needed by the community in such an overdeveloped area. Open space is far more needed than an aged care home servicing such a small percentage of the community which is already well catered for.